I had Synergy V2 working for a few weeks; after working fine for a week, it stopped work, then magically started working again. Anyway, updated to V 2.0.11 and it completely stopped working. I see v 2.0.12 is available so I downloaded that, and again it won't work. I deleted all and downgraded to V1. That's won't work either is it the server connection times out every time. Anyway, just seeing if anyone has any ideas to get it going? Server is Mac OS 10.13.4; Client is Windows 10 Pro. I did open a support ticket a maybe three weeks ago when I was having issues, but the only reply I got was offering a refund, so I haven't opened another ticket for this. I'd really, really like to get this working again instead of a refund if at all possible. I did try to go ahead and open a support ticket, but none of my uploaded logs are appearing in the drop-down menu. I'm sorry you are having trouble with Synergy. Step 1 for an easy fix is restarting Synergy service on all the machines. Step 2 easy fix is the restart the Synergy-core. The easy way is to mouse-grab one of the screen images in the Synergy UI and move it away a bit, disengaging it from the other(s), waiting a couple of seconds and reassembling to your liking. Step 3 Another trick I recently learned is going the saved msi installation file, right-clicking and choosing 'repair.' That sometimes gets things back on track. Step 4 not so easy is to reinstall. I see you've done several reinstalls. Every version of Synergy leaves behind some files when it is uninstalled by the usual methods and some of them affect the configuration of subsequent installations. When I am trouble-shooting Synergy, I use a 3rd party uninstaller to be sure I get everything. thanks.... the only thing I haven't tried is the MSI repair; looking for that now. Also, in both machines, sometimes when I try to restart the service it says it cannot connect. But in its typical state, the synergy helper on both machines will say connect. If I drag one of the monitors around in the helper, those changes are reflected on the other machine. So its communicating to some degree I guess, but I can no longer share mouse/keyboard between either of them. ok I did the complete uninstall-reinstall following the steps in your link above; still not working. I can drag the layout around and it still shows up on both machine helper programs, but it just will not share the mouse/keyboard at all. Was just browsing and since no replies to this one yet... do you mean your logs aren't showing up in here, before I carry on? 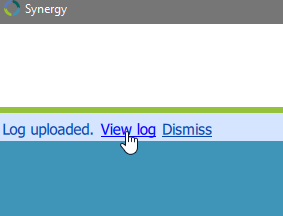 yes, they are not showing up in that "Synergy Log URL" box. I don't see any errors when uploading, and I can click view the log from the Synergy Helper program. [ Service ] [2018-05-24T13:49:10] debug: core process exited: exit code=1 expected=true error=The operation completed successfully. Mention it to support when they get in contact with you so that they are officially aware? I have the exact same problem as Brant. I upgraded from 2.0.9 to 2.0.12-beta last week, since then I haven't been able to get it working (not even once). My setup consists of a Macbook Air (High Sierra) and a Windows 10 PC too. With previous versions (up to 2.0.9) everything was more or less okay, i.e. I was content with it. I'm curious whether others are experiencing the same.